TREMENDUM PICTURES MAKES MOVIES. PLURAL. I recently read that 80% of all short film makers never make another film. That's a pretty terrible statistic. There's probably lots of reasons for people not taking a second dip into the filmmaking pool, but the biggest has to be that making a film is really, really, REALLY difficult. Earlier this year, I finally finished my first short film as a writer/director, The Shift, after an exhausting year and a half of work. There were times I wondered if I still would have made the film if I knew at the beginning how much blood, sweat, late nights, feelings of self doubt, favors, mistakes, computer crashes, and, yes, tears it would eventually require. That 80% statistic resonated with me in a big way. An ordinary, frustrated man receives sympathy and a job offer from the Devil himself. A film by Brock Heasley. Starring Travis Cluff, Gregory C. Tharpe, and Tina Johnson. Now appearing in film festivals across the U.S. So, with that statistic in mind, I thought about doing it all again. I weighed the pros (art, the high of creation, furthering a career in something I'm passionate about, the sense of community that grows up around a film, the need to tell a story, etc.) and the cons (see first paragraph), but ultimately I knew: there was no friggin' way I was gonna be part of that 80%. I want to make movies! So, no, reluctance wasn't gonna stop me. In fact, once I'd made up my mind to do it, the reluctance turned into an overwhelming drive and excitement. I NEEEDED to make movies. The only problem? Tremendum--and, by extension, my entire team--was already making a movie. Since the release of our Blumhouse-produced film, The Gallows, back in 2015, Tremendum has not remotely stood still. We created and operated a Gallows-themed haunted attraction; made The Shift and three spec trailers: Slugger, Secondhand, and Flicker; shot an entire second feature film, Challengers (you'll be hearing more about soon); and started consulting on other films. We keep moving forward, no matter what, believing the opportunities will come. Directors Travis Cluff and Chris Lofing watch playback on a scene from Abandoned. Travis' arms may or may not be diseased in this photo. 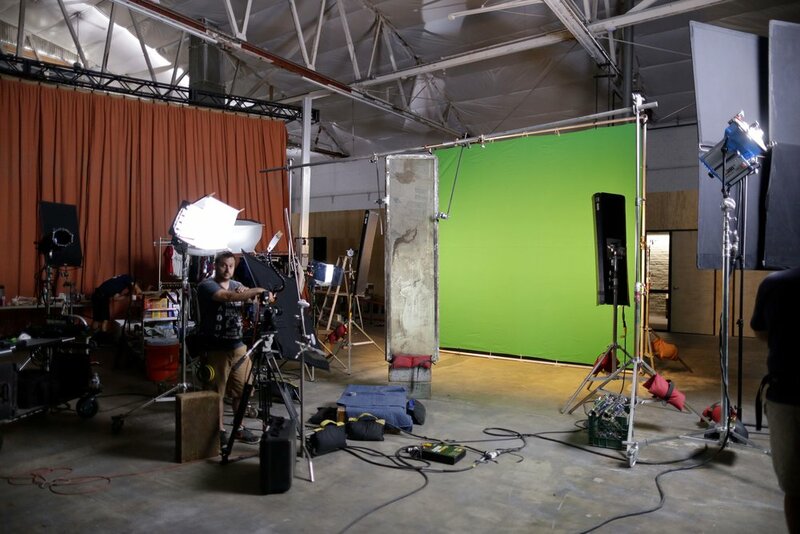 2nd Assistant Camera Troy Ruff, caught checking on equipment during a green screen day. Or stealing it. Not sure which. THE CREW. 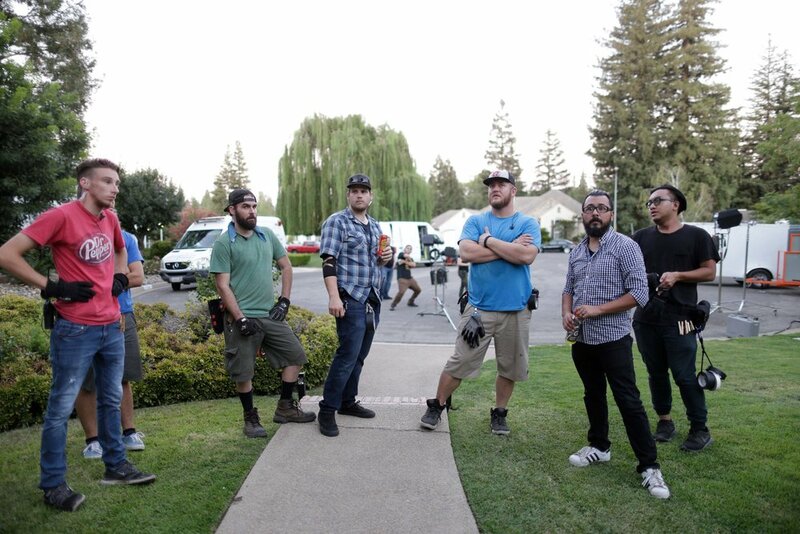 L-R: Grip Tyler Smith, Someone in a Blue Shirt, Best Boy Grip Jeremy Owen, Director of Photography Kyle Gentz, Key Grip Cody Fletcher, Script Supervisor Orlando J. Gomez, Grip Chad Saechao. Background: Set Designer Max Martinez. Not pictured in this photo: everyone else actually working. 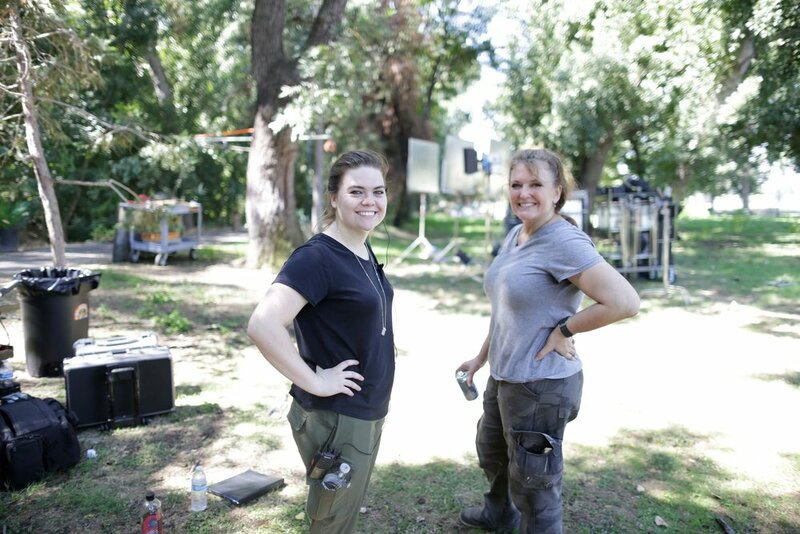 2nd Assistant Director Nicole Spate and Assistant Set Designer Renee Mason smiling like it isn't 108 degrees and they want to die. 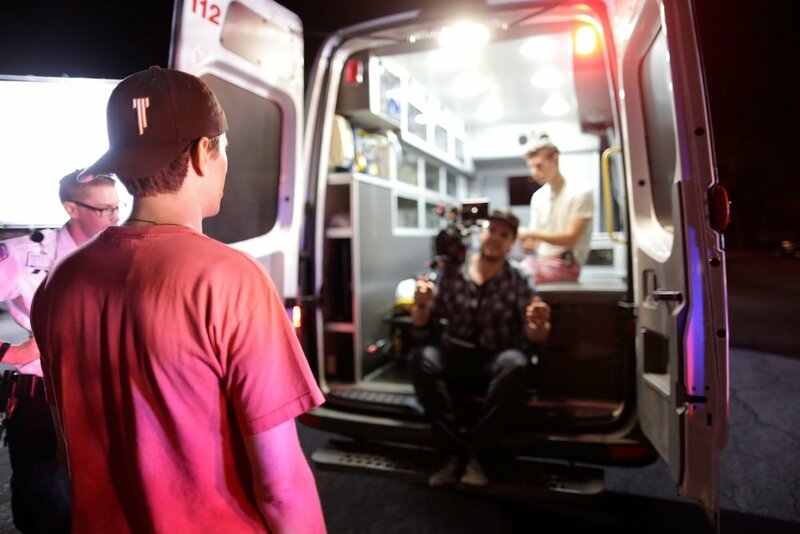 Director Travis Cluff readying a shot in an ambulance with a happy Director of Photography Kyle Gentz. The source of Kyle's happiness is still unknown, but is believed to be that morphine he found under the seats. Actress Vela Cluff humoring Director Chris Lofing. She's got this. Abandoned is a project that was brought to Tremendum as a completed film that needed some additional work done on it. 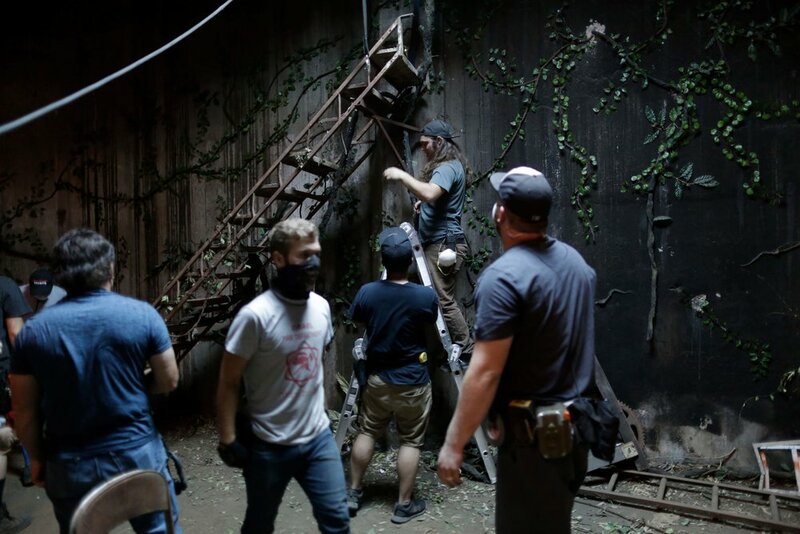 It came to us from an outside producer who believed we could do something special and you can pretty much tell it didn't originate with us because I doubt very much we would have ever given ourselves what seemed, at first, to be an impossible task: recreate a Malaysian jungle in Fresno, Ca. That's right, the film was originally shot in Malaysia and our task was to do an additional three weeks of photography without going to Malaysia. Do an exercise with me: Google Image search "Malaysia jungle." There. Did it? Okay, now imagine the exact opposite of what you're looking at. 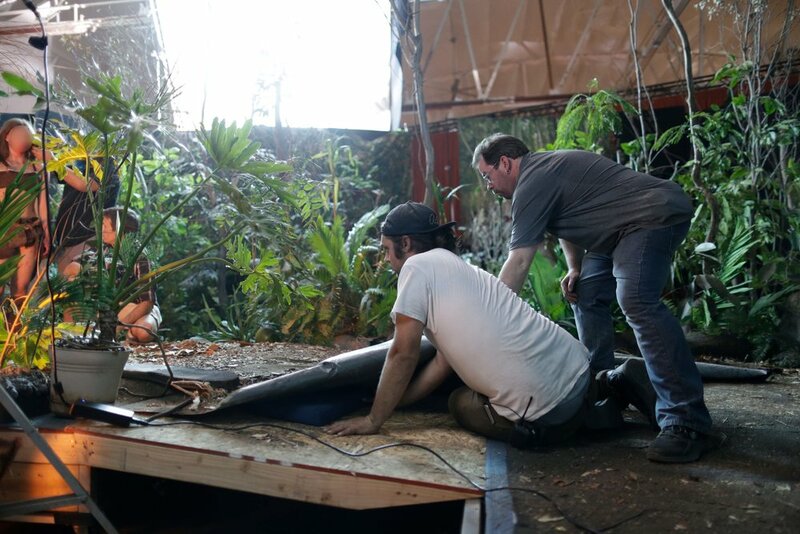 Set Designer Max Martinez and Assistant Set Designer Jason Moore laying down the floor on their studio jungle. Giant mosquitoes not included. Director of Photography Kyle Gentz playing peekaboo with, well, no one. Back to work, Kyle. Wide, brightly lit view of our studio jungle with all its parts. 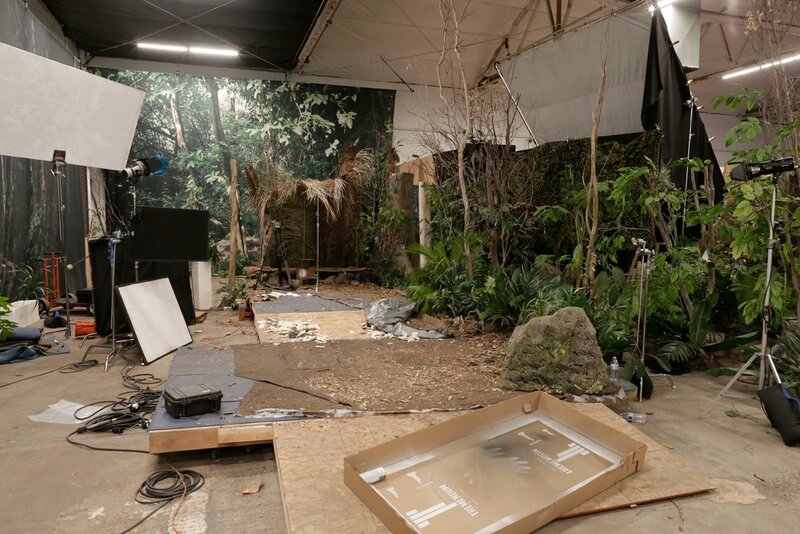 Aka, how you should never see our studio jungle. That's more like it. 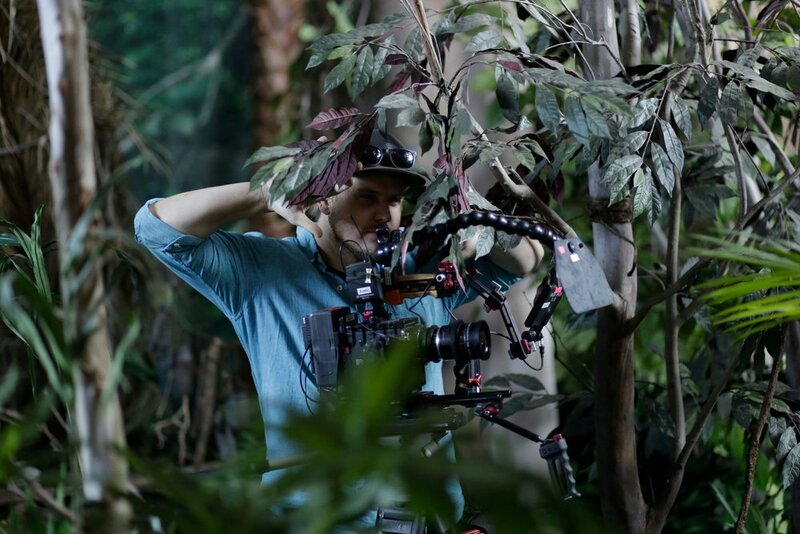 Director Chris Lofing forgets he's not in a real jungle for a second and looks over his shoulder to make sure the spiders aren't following him. Set Designer Max Martinez adjusts some stairs in our makeshift lighthouse amid a flurry of crew activity that deceptively looks like people just standing around. That's movie magic, folks. 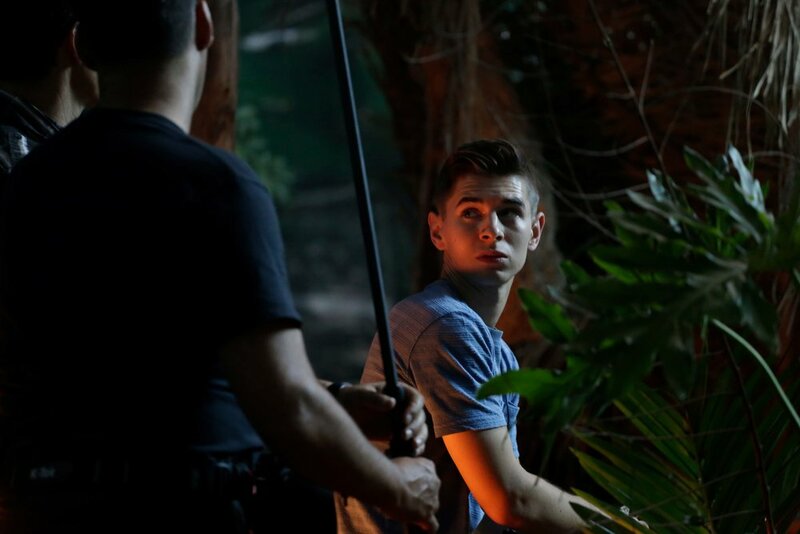 Shooting began in late July and ran for three weeks. In that time, we turned an indoor studio into a jungle, made an abandoned factory look like a lighthouse, built a church in the middle of a backyard, turned a swimming pool into an ocean, and made a park people drive past everyday into a jungle river. Next, I think we should try our hand at turning a shopping center into the moon. I mean, why not? If you're a Fresno native and you happen upon a Tremendum set, you're likely to think it looks pretty impressive. You'd see a crew about 30-40 people strong, tons of lights and food; a trailer or two, an expensive camera you do NOT want to drop; people doing hair or makeup or making sure the actors are dressed just right; and tons more cool movie-type activity that would make you go "Wow." But that's because you live in Fresno. You're not used to seeing film crews and have probably never considered or known the sheer amount of effort that goes into every second of a filmed product. Compared to a lot of L.A. sets (even to, say, your favorite T.V. show), we're small time. Scrappy. What you call "independent cinema," but with big connections. We do what we do and we stay where we are because there's something special about filming in Fresno. There's an excitement here and a thrill local businesses and residents have to be a part of our productions that just doesn't happen anywhere else. Plus, there's real beauty here. I know we're not used to thinking of Fresno that way, but you should see it through Director of Photography Kyle Gentz's lens. It's gorgeous. 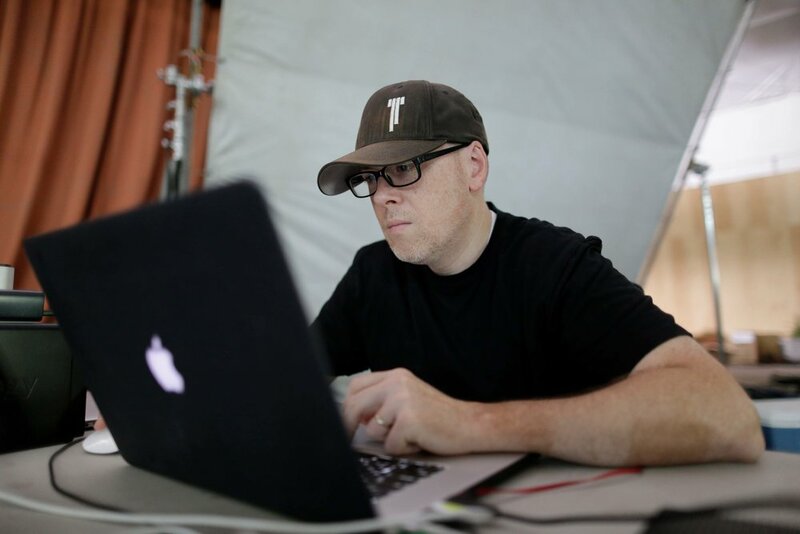 DIT/On Set Editor Brock Heasley doing his thing while all the magic happens on the other side of the curtain. Yeah, when you pull the curtain to see the man behind it, you get Brock. Pretty disappointing. I used my time during Abandoned wisely. When I'm not directing, my on set responsibilities include DIT (getting all footage we shoot into the computer and organizing it) and On Set Editing. This means I'm a bit away from the action and have some down time now and again to work on other things. I used the time wisely by honing my script, dialing up the people in charge of federal lands, drawing up storyboards, and inviting people to join my team when they were just trying to enjoy the catering. I worked on both things concurrently because that's the direction Tremendum is headed. We're a studio. A small studio (for now) maybe, but a studio means multiple projects. You can feel it in the air right now: things are moving faster and what started with Chris Lofing & Travis Cluff and their camcorder has grown into a real enterprise that keeps growing and growing. And Hollywood is taking notice. Time to go again... The Two Hundred Fifth gears up with a production meeting. More on that later. Lots, LOTS more from Tremendum to come.